Why should you care about search engine optimization? Well, if you are in business, you want customers to find you online. Did you know that 97-percent of Americans use the internet to search for local businesses. Search engine optimization, or SEO, is a fancy term for getting your business to rank higher in Google search results. Have you heard the joke? “Where is the best place to hide a dead body? On the second page of Google!” That’s because 75 percent of Internet users don’t scroll past the first page. Your business better be there or it’s as good as dead. You can pay to be on the first page of results with Google Adwords, but surveys show that 80 percent of users ignore paid ads. The place you want to be is in the organic results. Those are website listings and Google+ Local listings. Example of an optimized Google business listing. It’s hard to believe, but of the 50 million Google business listings, less than 20 percent have been claimed. These are free listings and show up in local searches. Claim and verify yours. Go in and fill out as many additional details as possible. 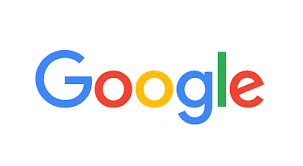 Be sure Google has your correct name, address, phone number and website address. Add your photos, description and categories. Find your free listing here: Google+. Good SEO is about clearly communicating who you are, where you are and what you do. Update your website to be crystal clear about these three things. Your website’s title should be something simple like: “company name | location/service | phone number.” Example: “Access Publishing | Paso Robles Web Design | (805) 226-9890.” The next most important thing to include is your location and category in your website’s headline. Example: “Web Design in Paso Robles.” Then be sure your full physical address is in the footer of your website. For more detailed advice read this article on advanced local SEO tips. Internet listings are a great way to improve your online presence. Be sure you have accurate and complete listings on Facebook, Yelp, Yahoo, Bing and your local Chamber of Commerce. Once those are complete, keep creating more online listings for your business. Be consistent with your business name, address, phone and URL. These listings will communicate to Google that you are a local authority in your field. The final step here is to write great content on your website and share it through your social media. Share tips and advice about your products or services. Write columns and articles and post them to your blog on a regular basis. When you have something newsworthy, send it as a press release to the local media and online through press release distribution services. When you claim your Google business listing, optimize your website, create online listings and write great content, the search engines will take notice and reward you with better rankings. You’re invited to learn more about how customers are looking for local businesses online and how to rank better in local search results. Call Access Publishing for an appointment to learn more about local search engine optimization. Call (805) 226-9890. Author Scott Brennan is a local SEO expert. 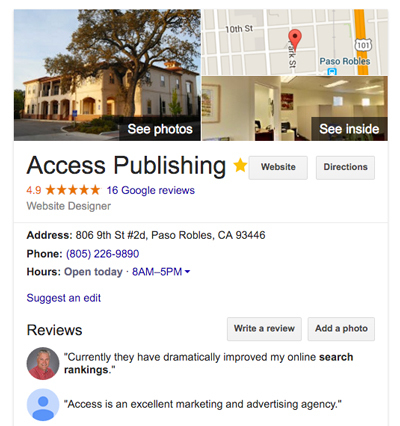 His company, Access Publishing, provides web design and SEO services to over 100 businesses in San Luis Obispo County.